During Holes in the World. 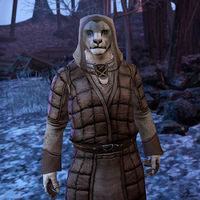 Mezha-dro is a Khajiit found in the Village of the Lost, he is a disciple of Meridia who was sent to this border realm to seal the tears in space which allowed various settlements to be dragged into this place. He can be found performing some sort of magic as you approach him, he will say "You! You are not dead!" Talk with him to see what he wants. He will then begin to follow you around as you lead him to the the dimensional tears. If you talk to him during this, he will just say, "Still more tears to close. Very bad. Coldharbour is no good for living." While he follows you he may make various remarks. Mezha-dro: "You fight like Mezha-dro's mother scolds. Using all five claws." Mezha-dro: "Mezha-dro wishes there were a person like you for every Daedra worshipper in the world." Mezha-dro: "Mezha-dro would like you to know he is glad you fight the Daedra, and not for them." Mezha-dro: "Keep watch while I close this." A spectral scene between Rararyn and a daedra will play out nearby. It's not enough. For what you're asking, I need more." After it is sealed, you can witness another scene showing how the village was brought to Oblivion. Once you have closed all three tears you can speak to him. Afterwards, he will teleport away. This page was last modified on 1 February 2019, at 05:24.